From the very beginning, I found Kingdom Hearts punishingly hard, even on normal difficulty. This came as quite a surprise. You see, I’ve been avoiding the game since it released in 2002, not wanting it to ruin my cred. When I heard nobody liked the series, I always assumed it was because it was a kind of proto LEGO game: simple, low stakes fun with little challenge. The sort of thing Core Gamers like myself would sniff at because it’s for kids – or worse, Casuals. When I discovered it was actually a complex and challenging experience, I headed to Reddit and GameFAQs for some internet wisdom to help me on my way. I expected the forums to be filled with chatter about how the game is bad on every level. But again, I made an assumption about Kingdom Hearts, and again, it proved me wrong. Conventional wisdom may say it’s trash, but there’s legion online who would disagree. 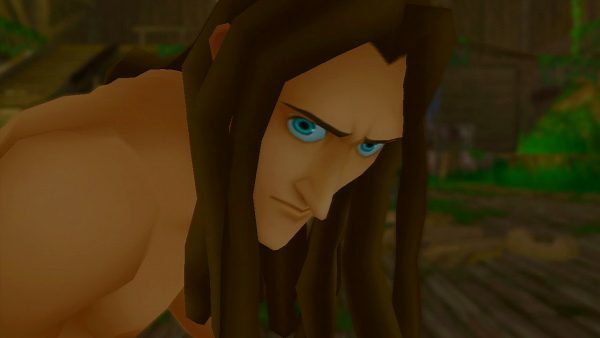 As I delved through 17 years of discussion and dissection, I discovered an open and accepting community long since disbanded, the echoes of which taught me the many nuances of why Kingdom Hearts is, in fact, really deep if you’re willing to put in the work. While I originally disliked almost everything about the game, the warmth of the forums – and the incisive design criticism I found there – quickly won me over. Kingdom Hearts isn’t a bad game; I was just a bad player. Once discovered, this simple truth refigured my understanding of its complexities and quirks. Below is an abridged account of what I learned; I only hope these facts similarly convince you that Kingdom Hearts is one of the best games ever made. Kingdom Hearts won’t hold your hand, Sonny Jim. In a 2019 filled with quest markers and mini-maps, I was revitalized by the game’s utter disinterest in telling players what it wants them to do. The Tarzan level, like the Lordran of Dark Souls, if you’ll forgive the obvious comparison, is a sprawling mass of player-driven possibilities. Do I go to the Bamboo Grove or the Treehouse first? I never ever had a clue, so I just wandered aimlessly around the level five or six times until a cutscene triggered. The sense of complete immersion – of really being lost in the world – was stunning. 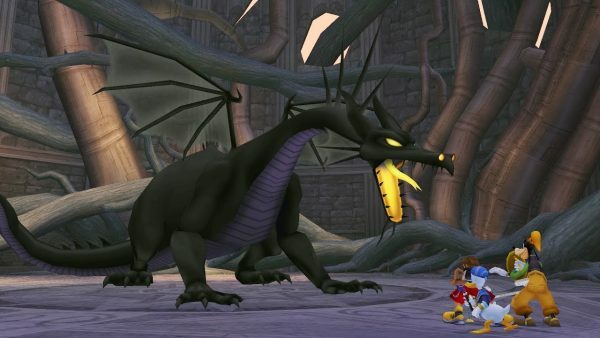 Speaking of Dark Souls, the combat in Kingdom Hearts is super weighty. Protagonist Sora isn’t particularly strong, so dodging and blocking an enemy’s attacks, then getting off a couple of your own before retreating, is always the best offence. Enemies hit hard and throwing Sora headlong at a battle usually results in a swift game over. Much better to dodge and weave, look for or create openings, and attack when safe. It’s classic Souls, really, except you’re usually fighting a dozen or more bad guys at a time, and Sora will auto-target the nearest one. But there’s a vital delay on this targeting, which means he mightn’t actually do what you intend him to. A lot of the time, Sora will continue aiming for an enemy even when it’s moved out of range. For Non-Core gamers, this leads to him attacking thin air and taking damage from closer enemies he should be striking instead. For people like me and my Reddit buddies, of course, the exact same happens. We just tell ourselves it’s part of the experience, because it is, and only we were Core enough to pick up on it. The “action” in this RPG is reassuringly omnipresent. Combat never pauses, even in the inventory. I died countless times because I had to press a button, scroll a menu, and press another button just to heal. I was a split second too slow. Back to the last save! And don’t beef the camera. It mightn’t track enemies or show the player what they need to see, but that doesn’t mean it’s bad. You are. 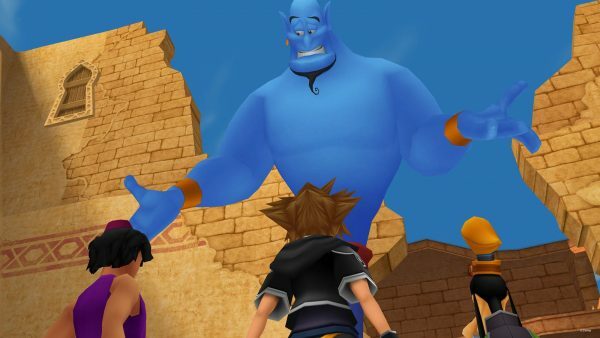 Don’t let the Disney mascots fool you: Kingdom Hearts is an RPG-assed RPG. Being correctly leveled and grinding to get there is core to the experience. Some might decry tying a game’s difficulty to the time a player is willing/able to invest, but I say nay. Grinding is like life, see, and if you’re not going to put in the work you shouldn’t be able to enjoy anything. Like, when I got to Agrabah from Aladdin at about 10 hours in, I was so overleveled I blasted through every fight there was. Jafar wasn’t easy because Jafar is easy, but because I’d taken the time to make Sora stronger than the game expected him to be. I had a blast playing on Easy Mode for a while, but that was earned because I’d worked for it. It’s not even like the game makes grinding hard, either. Enemies respawn constantly in levels, meaning you’ll always be fighting, even if you’re just going back to grab collectables. And the Hercules level is an infinitely replayable combat tournament. There’s no story or anything, just a tangential connection between the gladiatorial tournaments that weren’t in the movie and RPG grinding! If that wasn’t enough RPG for you, there’s a robust crafting mechanic. Enemies very infrequently drop ingredients that, after 50 or so hours of harvesting, can be forged into the game’s best weapon. This isn’t a review from 2002, but Kingdom Hearts still gets maximum Value For Money points in my view. Hollow Bastion is to Kingdom Hearts what Sen’s Fortress is to Dark Souls, if you’ll forgive the obvious comparison. It is an enchanting maze of walkways to fall off of and expanses of wonderful, unintended backtracking. “The Bas” introduces loads of flying enemies that float over massive vertical drops to earlier parts of the level. Given the game’s pro-only enemy targeting, only the Corest are able to kill everything without repeatedly plummeting and having to retry every encounter. Newbs and Casuals would try and attack Hollow Bastion’s aerial dinosaurs on their own terms, and this is why they aren’t taken seriously on the forums. Letting the game target the nearest enemy, as it is designed to do, is the surest way of repeating these encounters interminably. Better to coax them into a corner, one at a time, and use the level geometry to break both your enjoyment of the game and their ability to inhibit your progress. Nobody said winning was easy, after all. A similar strategy worked really well during a late-game boss. Maleficent, the evil fairy from Sleeping Beauty, had transformed into a massive dragon and was pummeling me with area of effect stomps and firey projectiles. I went and hid in a corner of the room where neither of these could reach me and just waited it out. My AI buddies Donald Duck and Goofy Dog died over and over again, but would keep respawning and whittling down the fiery lizard’s health, until she was finally vanquished. If you’ll forgive the obvious comparison: you killed the Hellkite Wyvern in Dark Souls on equally unfair terms, so I feel no shame. At the very start of the game, sandwiched between a cutscene about a tsunami and an impromptu boss fight, I was asked to pick weapons. “Shield, sword, and stave,” questioned the game, “which will you toss, which will you save?” I picked the shield and stave because they looked the coolest. One had Mickey Mouse’s silhouette on it, the other wore a hat – a hat, on a magical staff! So cute! It was a whimsical decision with far-reaching consequences. The weapons affected my starting attack, defense, and magic stats, and also defined things far in my future like maximum inventory slots and the order in which I unlocked Very Important skills. About 20 minutes later, the game put me through a fanciful personality test. What am I afraid of? What do I want outta [sic] life? That sorta [sic] thing. My answers apparently set whether I’d level quickly to 40 and slowly thereafter, or vice versa. I’m glad I didn’t know. Casuals, mollycoddled by slightly more transparent design, would find zero merit in obfuscating these sorts of decisions. When I worked at Currys in Walthamstow, selling consumer electronics on credit to consumers who couldn’t otherwise afford said electronics, I struggled to meet my ridiculous sales targets. A manager invited me to a “training session” one lunch so he could give me some pointers. As soon as I sat down I was informed I’d willingly entered, and thus agreed to participate in, my first “performance review.” That level of duplicitousness is something everyone should experience; Kingdom Hearts has it right. Kingdom Hearts is just difficult. Even with a fully kitted out Sora, it’s the right type of hard: hard. Bosses have four or five health bars and attacks that are somewhere between difficult and impossible to avoid, lots of which you can’t even cheese. The end of the game is an extended boss run with no save points for hours. Only the best Core Gamers should apply. And while I definitely am Core, I regrettably didn’t have the time to finish Kingdom Hearts. My dog ate the disc, so I had to watch the end on YouTube. Otherwise, I would have definitely continued grinding for the Ultima Weapon. That I didn’t finish Kingdom Hearts myself doesn’t bother me. I knew what I needed to do, and though I didn’t actually do it, knowing – that fundamental understanding of what a game is asking of you – might really be what makes a Core Gamer. Having the dexterity and patience to finish a hard game doesn’t make someone an inherently better player, it just means they have faster hands, hands all slathered in time. If that doesn’t sound like you, play on easy and have a blast. I know I wish I had.